https://www.pinterest.com/avaisabellasmum/solar-systems-activities/ A nice page on Pinterest that is full of links for children learning about the Solar System. http://www.planetsforkids.org/Planets for Kids - articles, coloring pages, quizzes This site was recommended by a person in Cary, N.C.
http://www.prongo.com/eight-planets/ create your own solar system using the 8 planets. You can then print it. http://www.prongo.com/space_world/ create your own space world and then print it. Great for creative writing as a follow-up. 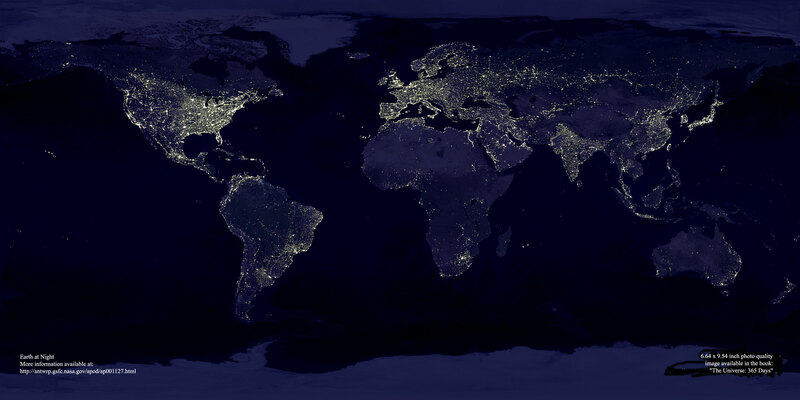 http://antwrp.gsfc.nasa.gov/apod/image/0011/earthlights_dmsp_big.jpg A neat site that shows what the earth looks like at night - it shows the lights on earth. http://www.mjjsales.com/articles/tools-and-resources-for-sun-calculations-and-observations.html Tools and Resources for Sun Calculations and Observations - There are links for Atronomical Terms, Daylength-Charts, Moon Phases and Positions, Solar Energy Information, Sun Position (Azimuth and Altitude), Sunrise/Sunset Calculators, and Sun Calendars. This site was recommended by a person in Compton, California. http://hea-www.harvard.edu/ECT/the_book/index.html Eyes in the Sky Feet on the Ground - collection of children's online astronomy activities. In the following six chapters are hundreds of fun explorations into astronomy as a classroom tool for learning how to theorize, experiment, and analyze data. The activities are fully illustrated and contain detailed, step-by-step instructions as well as suggested discussion topics. This book is lots of fun for teachers and students alike. http://greatballsoffireexhibit.org/docs/solar_system_puzzle_kit.pdf Solar System Puzzle Kit: Download this pdf kit from NASA; your students can make an eight-cube solar system puzzle of the entire solar system with the kit, while learning much about the asteroids, sun, and planets. Grades 5-8.
http://www.solarviews.com/eng/homepage.htm Views of the Solar System: What a resource... bookmark this site as you can use it for lesson plans, activities, history of the space program, and a multimedia adventure through the solar system. http://www.exploratorium.edu/ronh/solar_system/ Build a Solar System - Want to get an accurate sense of space? That's the purpose behind the dynamic distance calculators at "Build a Solar System." Enter a size for the sun -- one that you can easily imagine -- say an inch or maybe a foot, the site will generate the resulting relative distances to the planets. The numbers are eye-opening, to say the least. Sunglasses optional. http://www.exploratorium.edu/ronh/weight/index.html Your Weight on Other Worlds - If you've checked out "Build a Solar System," you probably have anewfound sense of just how very distant the other planets are from Earth. Now you can augment your concept of the other planets by figuring out your weight on those celestial bodies. Weigh 150 on Earth? The upside: You're a svelte 10 pounds on Pluto. Unfortunately, you'd weigh about two zillion pounds on a Neutron star. Can't win them all. http://www.teacherspayteachers.com/Product/Solar-System-Bingo-794032 Great BINGO game for the solar system - print cards and play! The only drawback is you need to pay $2.00 for it. http://sciencespot.net/Media/solarsystem_bingo.pdf Here is a FREE version for BINGO.. Students are given a list of words that they fill in on the Bingo Card. Included is the list of information that is given by the caller for the bingo game.